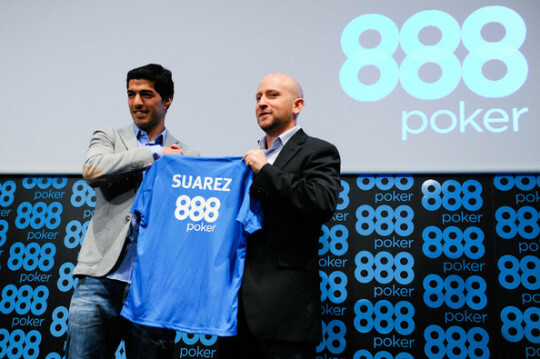 Luis Suarez, the Liverpool and the Uruguayan national team striker that is participating in the World Cup in Brazil, has been was named last month in Barcelona as the new ambassador of 888poker, one of the world’s leading poker rooms. Recently chosen as ‘Best Player’ of the English Premier League by the association of the press and the competition itself, Luis Suarez is also a serious candidate to the ‘Golden Boot’ for this 2013/14 season. The Uruguayan sum 31 goals, the same as Cristiano Ronaldo (31), and three more than Leo Messi (28), his closest pursuers. Suárez has said during the presentation that due to commitments with preparing the World Cup selection, he may not take part in events such as the WSOP, but has announced that in the near future he will appear in tournaments, both live and online. The Uruguayan striker joins the 888poker team which already includes other athletes , although many of them are better known in the UK than in any other country. “Luis is going to do a lot of very special things with our customers. He will bring exclusive content with him and users will be able to play online against him. That’s fantastic,” explained 888poker staff members.